I first came across Steven Covey from his best-seller – The Seven Habits of Highly Effective People. As Covey himself agrees, these habits are pretty self-evident. But it can be a very good thing to state the obvious in a way that gives us a fresh perspective. The Seven Habits made me think. Some critics contend that Steven Covey offers “quick fixes ” that are impractical or idealistic. All I can say is that The Seven Habits of Highly Effective People helped me. – Did I change some habits as a result? Steven Covey – Begin with the End in Mind – Steven Covey stops short of ever stating something like the Law Of Attraction, but with this Habit 2, he’s hit upon a very fundamental principle for creating what we want in our lives. This habit is just plain good advice – advice that I found useful even before I came to understand the Law. Once understood, the power of this approach becomes even more obvious. What’s important, before we begin anything, is to get wrapped up in the vision of where we want to be. Then the forces of the Universe get lined up to create “accidents” and “concidences” that can effortlessly deliver to us what we’ve been seeking. 1. If I allow myself to be driven unconsciously by the “tyranny” of the urgent but (mostly) unimportant (Quad 3), then once again I’m condemning myself to more of Quad 1. 2. The more time I spend in Quad 2, the less I will spend later in Quad 1. 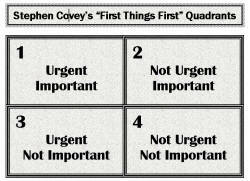 Ken Blanchard of “The One Minute Manager” fame has a different take on these quadrants, and I have my own also – see Self-Help for more on this. Steven Covey was born on October 24, 1932 in Salt Lake City. Born and raised a Mormon, he served for a time as a missionary in England and he remains strongly committed to the Mormon church. He earned his undergraduate degree from the University of Utah, his MBA from Harvard and completed his doctorate at Brigham Young University. While at Brigham Young University, he was assistant to the president and was also a professor of business management and organizational behavior. In 1997 the Covey Leadership Centre merged with the Franklin Quest Company (of day-planner fame). In announcing the deal, management were optimistic – “We intend to apply our own expertise to our own merger, thereby creating a model merger for corporate industry.” Sadly, like the vast majority of mergers, the difference in cultures was hard to reconcile, and good habits or no good habits, the stock remains in the tank. What can I say – even gurus don’t always get it right! … plus a number of children’s books. I’ve noticed on the web there’s a few Steven Covey critics from the fundamentalist ranks warning of the dangers of getting infected with Mormon heresy. Having read their criticisms, I confess I’ve become more kindly disposed towards Mormonism than my former prejudices would allow. There’s a lot in it I still can’t warm to, but the Mormon concept that we are all part of (rather than separate from) God seems to line up pretty well with everything else I’m discovering – that there’s a spiritual (vibrational) side to us that exists outside of our space-time limitations. And the more in touch with that side of us we can get, the more joy we experience.